We had a wonderful time at the Health Symposium in Tucson April 28/29, meeting many new customers, and enjoying the presentations by Caldwell Esselstyn M.D. ("Prevent and Reverse Heart Disease"), Rip Esselstyn ("The Engine 2 Diet"), Jane Esselstyn (Rip's sister and a school nurse), Ann Esselstyn (the dr.'s wife), Jeff Novick and John Robbins. Ann and Jane spent a fair amount of time at my table, tasting things and asking me how I made them; they were really nice people. 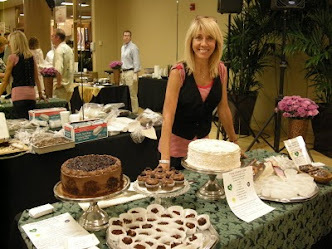 Jane would like to get some recipes from me as she is the one who writes the cookbooks for the Engine 2 Diet. I want to thank Healthy You Network for producing the event (this means you, Sheryl Greenberg); it was well-organized and very nicely done. I thank all the attendees who so warmly welcomed us to Tucson; people here are very unaffected and sincere. Not only did we sell out of the bakery items we brought, we also got orders that I baked for this past weekend. 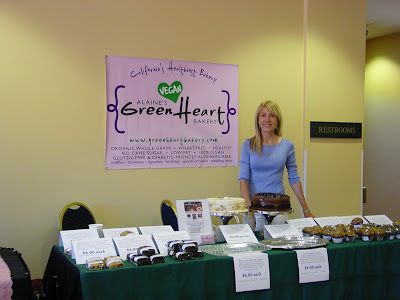 I forgot that my banner still says "California"s Healthiest Bakery"! We'll change it to "Arizona's"! Which reminds me to remind you: it's time to order for Mother's Day! I decorate Mother's Day cakes with fresh flowers, or you can order a Fresh Fruit Tart, which has traditionally been a VERY popular Mother's Day treat. Treat your mom to something beautiful, delicious, and healthy!